The Reds announced Friday that they’ve selected the contract of infielder Zach Vincej from Triple-A Louisville and released right-hander Lisalverto Bonilla to clear a spot on the 40-man roster. Right-hander Ariel Hernandez has also been recalled from Louisville as a September call-up, per Cincinnati’s announcement. Vincej, 26, was the 1132nd pick of the 2012 draft — all the way down the board in the 37th round. He’s slowly risen through the minor league ranks and had a huge performance in last year’s Arizona Fall League before hitting .270/.325/.370 in his first taste of Triple-A this year. Vincej doesn’t rank among Cincinnati’s top prospects, but he’ll provide some up-the-middle depth for the Reds in his first look as a Major Leaguer. Bonilla, 27, returned to the Majors for the first time since 2014 this year, though the results weren’t favorable. In 36 2/3 frames, he was torched for an 8.10 ERA — allowing 33 earned runs on 42 hits (eight homers) and 22 walks. He also hit a pair of batters and threw three wild pitches. Bonilla has a history of missing bats in the minors, but he averaged just 6.9 K/9 against his 5.4 BB/9 in 2017. The Reds announced on Monday that they’ve claimed right-hander Lisalverto Bonilla off waivers from the division-rival Pirates. The 26-year-old Bonilla had been designated for assignment in Pittsburgh last week after the Bucs acquired righty Pat Light from the Twins. The 26-year-old Bonilla made his big league debut with the Rangers back in 2014 but missed the 2015 season due to Tommy John surgery. Once a fairly well-regarded prospect in the Phillies and Rangers organizations — the Rangers picked him up from Philadelphia in the trade that sent infielder Michael Young to the Phils — Bonilla spent the 2016 season working his way back to health in the Dodgers’ organization. In 111 innings split between the Double-A and Triple-A affiliates of the Dodgers, Bonilla logged a 3.97 earned run average with a 118-to-40 K/BB ratio. In his brief big league stint with Texas back in 2014, Bonilla pitched to a 3.05 ERA and a 17-to-12 K/BB ratio in 20 2/3 innings. The Bucs had signed Bonilla to a Major League deal earlier this offseason. 8:26pm: Bonilla received a $575K guarantee on his deal, tweets MLB.com’s Adam Berry. Considering the right-hander’s lack of big league experience, the minimal guarantee isn’t much of a surprise. 5:25pm: The Pirates announced on Tuesday that they’ve designated left-hander Jeff Locke for assignment and signed right-hander Lisalverto Bonilla to a Major League contract. The 29-year-old Locke has long stood out as a non-tender candidate due to his recent struggles and his projected $4.2MM salary for the 2017 season (via MLBTR contributor Matt Swartz). 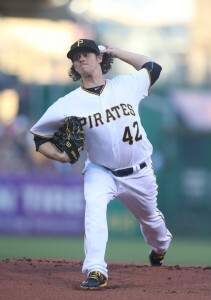 Locke functioned as a serviceable back-end starter for the Pirates from 2013-15, pitching to a 3.98 ERA with 6.6 K/9 against 3.6 BB/9 with a ground-ball rate north of 51 percent across 466 innings. However, Locke also averaged fewer than six innings per start in that time, and his numbers declined in 2015 before taking an even more drastic downward turn in 2016. This past year, Locke logged a lackluster 5.44 ERA with a diminished 5.2 K/9 against 3.1 BB/9 and a career-low 47.2 percent grounder rate. Right-handed opponents teed off against Locke this year as well, hitting him at a .299/.368/.508 clip in his 127 1/3 innings. As for Bonilla, the 26-year-old once rated as one of the better prospects in the Phillies and Rangers organizations — he went from Philadelphia to Texas in the 2012 Michael Young trade — but saw his career stall in the upper levels of the Rangers’ system. He landed with the Dodgers on a minor league deal last winter and enjoyed a nice season pitching in the hitter-friendly Pacific Coast League, where he recorded a 3.97 ERA with a 118-to-40 K/BB ratio in 111 innings (13 starts, 18 relief appearances). Here are a couple minor moves that were lost in the shuffle during a very busy Tuesday. The Dodgers have signed 25-year-old righty Lisalverto Bonilla to a minor league deal, CBS Sports’ Jon Heyman tweets. They non-tendered Bonilla earlier this month, six weeks after claiming him from the Rangers. Bonilla missed the entire 2015 season after having Tommy John surgery in the spring, but he struck out 11.1 batters per nine innings at Triple-A Round Rock in 2014 and held his own in the big leagues. He might have some upside as a reliever once he gets healthy. The Angels have signed outfielder Quintin Berry to a minor league deal, Mike DiGiovanna of the Los Angeles Times tweets. Berry hit .228/.329/.287 in 426 plate appearances with the Red Sox’ Triple-A Pawtucket affiliate in 2015, then caught on briefly with the Cubs at the end of the season. Between the two stops, he stole 37 bases. Though he has only 342 career regular season plate appearances in the big leagues, he played in the postseason with the Tigers in 2012 and Red Sox in 2013, also suiting up with the Cubs in last season’s playoffs. His speed could perhaps make him an October weapon again at some point despite his age (31) and limited offensive ability. The Dodgers have claimed righty Lisalverto Bonilla off waivers from the Rangers, the club announced. He has been placed on the 60-day DL by Los Angeles. Bonilla, 25, spent all of the 2015 season on the DL after undergoing Tommy John surgery in April. He had reached the big leagues for the first time in the prior year, allowing seven earned runs with 17 strikeouts and 12 walks over 20 2/3 innings for Texas. While he made three of his five MLB appearances in a starting capacity, Bonilla has mostly worked as a reliever in recent years in the minors. At Triple-A in 2014, Bonilla threw 87 1/3 innings of 4.33 ERA ball (34 relief appearances, nine starts), with 10.8 K/9 against 3.3 BB/9. He has consistently posted double-digit strikeouts per nine since moving to the pen.